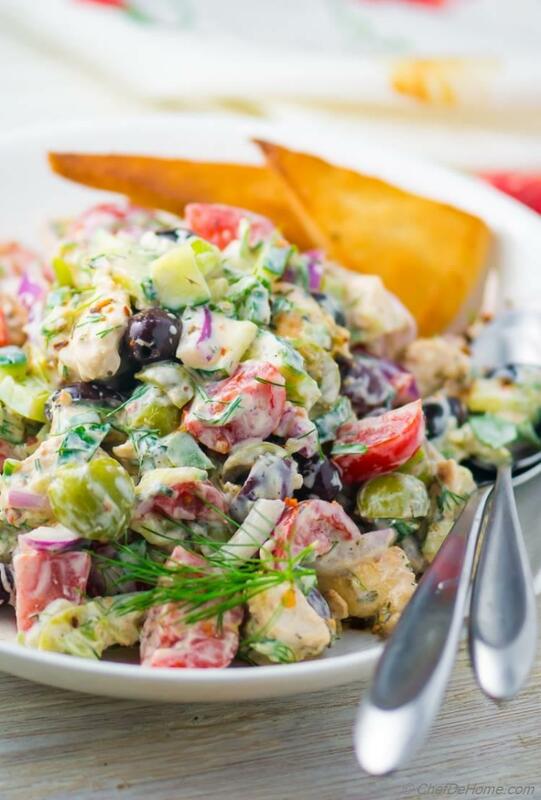 Tzatziki Chicken Salad, a creamy chicken salad with grilled chicken, cherry tomatoes, cucumber, olives, coated in refreshing yogurt-dill tzatziki dressing. Carb free, low fat, gluten free, protein-rich and loaded with delicious flavors! 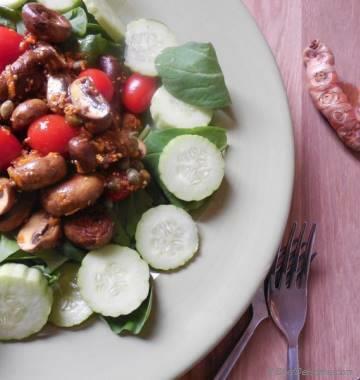 Bring it to potlucks, or treat yourself to a no-carb protein-rich meal, or simply serve for dinner with side of bread...This chicken salad works either way! This week has been totally Mediterranean food week! Don't you think? 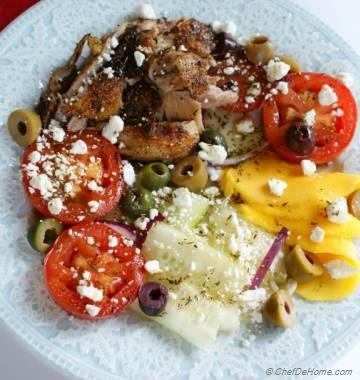 We started with Chicken Souvlaki from sunny Greece, added magic of homemade Tzatziki sauce! 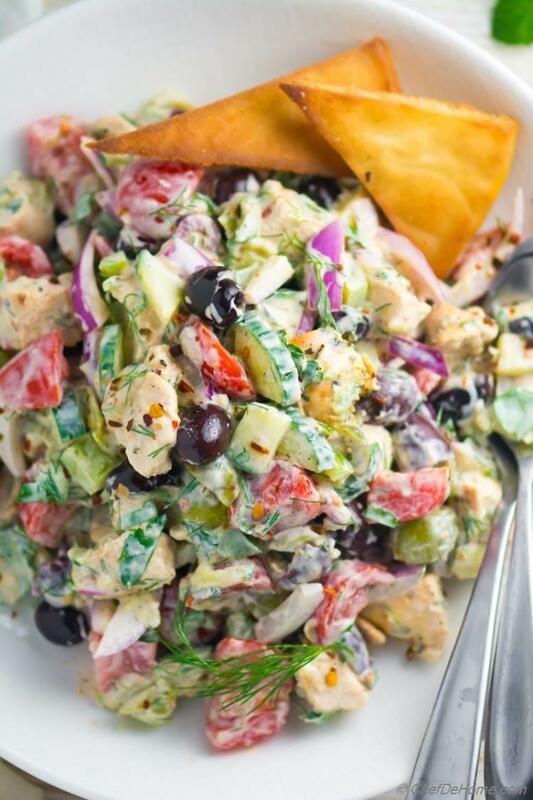 Today, I'm wrapping up week with this creamy Tzatziki Chicken Salad! 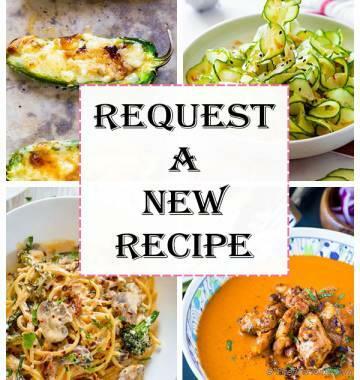 I love sharing a set of recipes which compliment each other. Honestly, this is how I cook at home by planning a menu over the weekend, buying some ingredients fresh and picking some pantry! Like this week, clearly, chicken salad is bonus of cooking chicken kabobs and tzatziki... still it is a complete delicious meal. This is why I asked you to save some chicken kabobs and tzatziki sauce. 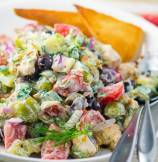 If you have those leftovers, this chicken salad comes together under 10 minutes.. If not, no worries! You can actually use any cooked chicken for this recipe. Grilled chicken, roasted chicken, or rotisserie chicken! All will work here! Star of this salad is - tzatziki sauce. For sauce, I use a cup of leftover tzatziki but you can make a fresh batch in 10 minutes. When I'm not using leftover tzatziki.. 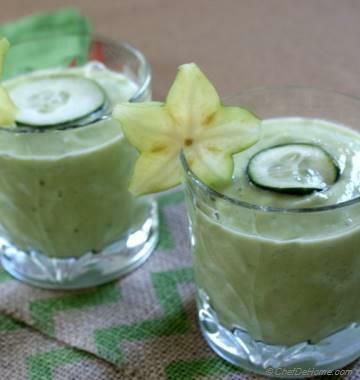 I don't mix in grated cucumber in yogurt but chop it and add to salad only. This saves me one step when I'm making this chicken salad from scratch. To give you complete recipe in on recipe card, I have included the tzatziki sauce dressing recipe in the post again. 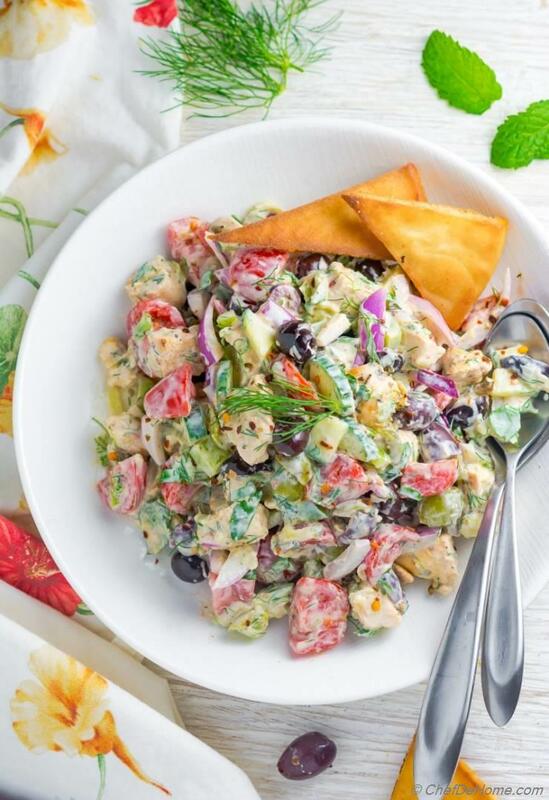 If you plan to make bigger batch of tzatziki, use the other recipe and reserve one cup for making this salad. So I say if you planning to make chicken souvlaki this week? Or just in mood to grill some chicken! Save some, then make tzatziki to serve on the side! Total Time 15 minutes Prep Time 15 minutes Cook Time 0 minute Difficulty Easy Yields 3 Servings Serves 3 Notes 2-3 Main or 4-5 Side servings. 1. To make tzatziki sauce, in a wide salad bowl, mix all tzatziki sauce ingredients. Fold in herbs and small diced cucumber. Taste and adjust salt/black pepper. Refrigerate while preparing rest of salad ingredients. 2. In meantime, chop cooked chicken to bite-size pieces. Also, dice veggies - bell pepper, olives, tomatoes, red onions, jalapeno(if using). 3. 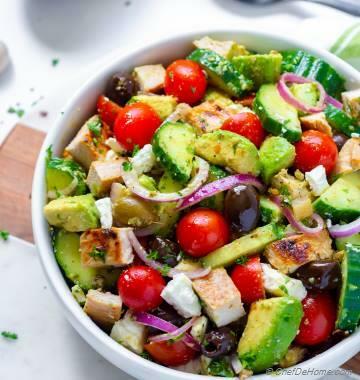 Add all chopped chicken salad ingredients into salad bowl with Tzatziki. Add cumin powder and one more tablespoon lemon juice. Fold to coat everything into creamy dressing. Taste and adjust salt and pepper. Serve immediately. Refrigerate until ready to use. If serving later, don't mix in tzatziki sauce into salad. Add it 30 minutes before serving. Chill after mixing. Savita, What are the toasties that accompany the dish? Are they store bought or homemade? They look delicious. I usually get salted baked pita chips for this salad. But one in picture are homemade. A store-bought pita bread, cut into triangles and then shallow fried in oil until lite brown and crisp. Lite dusted with salt and pepper while still hot. Turn out delicious evertime. I hope it helps. Do you think you could use canned chicken? Melissa, I have never tried canned chicken nor I recommend it. 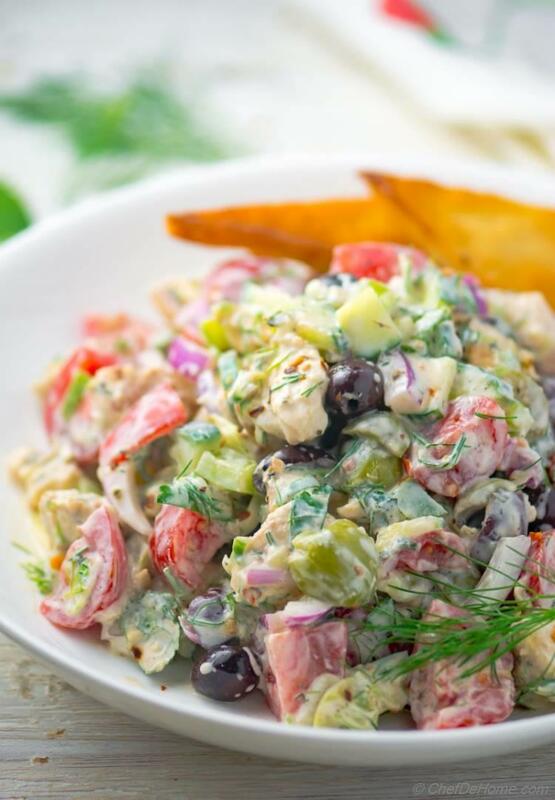 That being said, chicken salads such as this tzatziki salad, are not very demanding and any cooked chicken works well here. So, if you okay with canned chicken taste/texture it will be fine too!